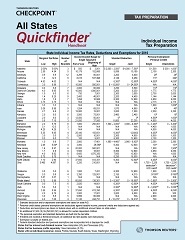 Get a complete, concise, and consistent summary of instructions for filing out-of-state individual income tax returns with the All States Quickfinder Handbook. The handbook covers returns for all 50 states and the District of Columbia, presenting topics in a consistent form - making it faster and easier for you to find information for any state. See information above for new edition availability. To order the current or prior tax year editions, please call us at 800 510-8997 800 510-8997 FREE.